Stars: John Cho, Debra Messing, Joseph Lee, Sara Sohn, Michelle La. In 2014 we had the film Unfriended, a thriller that played out virtually on computer screens. This tense and innovative new thriller ups the ante on that concept and uses the full gamut of modern technology and social media tools – from Facebook to You Tube, Google, instant messaging, etc, combined with mobile phone footage, CCTV and surveillance video and even television news broadcasts – to tell the story of the desperate hunt for a missing teenage girl. Much of the action plays out on a laptop screen blown up for the big screen. David Kim (played by John Cho, from the stoner Harold and Kumar series, the rebooted Star Trek, etc) is a loving father and husband living in the picturesque California suburb of San Jose. An opening montage compiled of You Tube footage and photographs shows us the family through many happy moments up until the death of his wife Pamela (Sara Sohn) from cancer, a sequence that will recall the opening of the wonderful animated film Up, which built up the sense of an entire relationship and family dynamic in mere minutes. Since the death of his wife though David’ relationship with his 16-year old daughter Margot (Michelle La in her film debut) has grown a bit tense and distant. David and Margot seem to keep in touch during their busy days via regular phone calls and texting. One night, Margot leaves to attend her regular study group and doesn’t return home. There are two missed phone calls on his mobile from Margot, and David is plagued by a sense of guilt that he missed her last desperate calls. David soon discovers some disturbing facts about Margot’s behaviour that reveals that he didn’t really know his daughter that well. He was oblivious to a sudden change in her behaviour. She had not attended her regular piano lessons for several months and many of her friends also reveal that they didn’t know her that well either and they have no clue where she might be. After a couple of days, David files a missing persons report. Detective Rosemary Vick (played by Debra Messing, from the hit tv series Will & Grace, etc), a decorated local officer, begins to investigate. Vick is a single parent herself and seems to understand David’s anxiety. At Vick’s urging, David begins to trawl through Margot’s various social media postings to try and find clues as to her disappearance in cyberspace. He begins to probe her secret life. Then Margot’s car is found abandoned at a nearby lake, and the mystery deepens, and David has to face every parent’s worst fears. He also enlists the help of his somewhat shady brother Peter (Joseph Lee, from the award-winning Lion, etc). And it gets worse when internet trolls begin suggesting that David is somehow responsible for Margot’s disappearance. 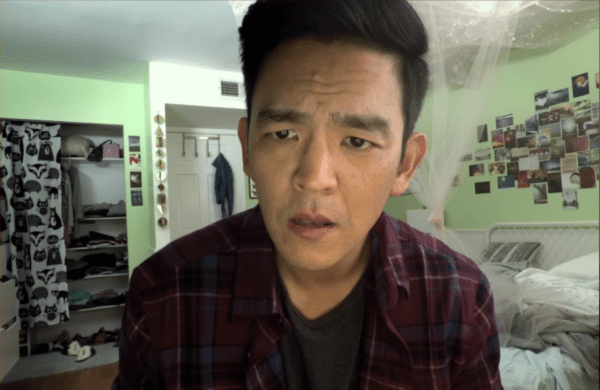 Searching has been cleverly scripted by long time writing partners director Aneesh Chaganty and producer Sev Ohanian (Fruitvale Station, etc), and the pair throw in several red herrings as the film works towards its denouement. However, there is a twist here that even veteran thriller lovers will not see coming. However, if you watch the film a second time, you will find that there are some carefully planted clues that point to the identity of the person responsible for Margot’s disappearance – if you look closely enough. Searching is a contemporary high concept thriller told via technology as David follows Margot’s digital footprint, and the film unfolds through a variety of screen technologies. It is a bold creative choice that taps into our obsession with technology, but it works, and accentuates the growing tension that is almost Hitchcock-like in its intensity. The whole thing has been cleverly put together by cinematographer Juan Sebastian Baron (The House On Pine Street, etc) working with editors Nicholas D Johnson (Hold On, etc) and Will Merrick (his first feature), who were responsible for both the virtual photography and cleverly putting together the various digital formats to ratchet up the suspense. The filmmakers use some visually inventive ways to present the information and sustain the audience’s attention. Searching marks the feature film debut for director Chaganty, and he is working under the auspices of visually stylish Russian producer Timur Bekmambetov (Wanted, etc). The film largely unfolds from David’ perspective, and Cho, who is on screen the whole time, brings an intensity, creeping sense of dread and a palpable sense of emotional angst to his performance as the distraught father. Cho elicits sympathy from the audience. La has a natural presence, while Messing delivers a layered performance as Vick. There are a few inconsistencies in the plotting, and the ending seems a bit rushed, but still Searching grabs you and holds you for most of its 90 minutes.